Authorities Wednesday sought the public's help to identify a girl between 8 and 13 years old whose body was found partially stuffed inside a duffel bag near an equestrian trail in the Hacienda Heights area. A sketch depicting the girl -- described as African American, 4 foot 5 inches tall and 55 pounds -- was released during a news conference. The sketch shows her wearing a pink long sleeved shirt that read, "Future Princess Hero," and patterned pants. 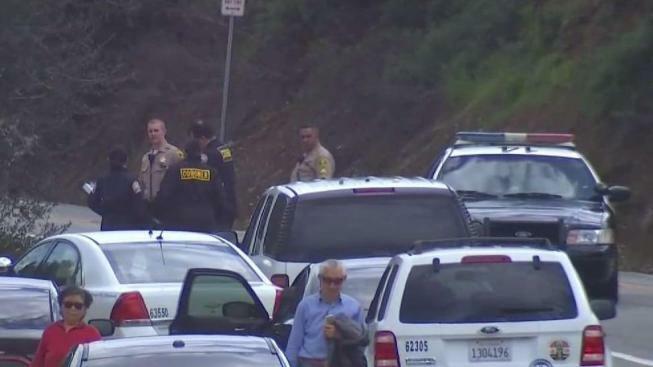 County workers clearing brush and doing maintenance on a trail discovered the body Tuesday about 10 a.m., said Los Angeles County Sheriff's Lt. Scott Hoglund. On Thursday morning, there was a card wrapped in plastic and secured to a fence post near the site. It reads, "Rest in peace sweet baby girl" and features a drawing of three people standing next to a flower. Investigators believe the body was dumped down an embankment south of Colima Road sometime between Sunday night and the morning the body was found. The area is near a Buddhist Temple. Authorities said they were in contact with Child and Family Services, as well as missing persons agencies, but had no leads about who she was, nor how she died because there was no obvious signs of trauma. They were looking for witnesses who were traveling through the area between Sunday and Tuesday. They also wanted to hear from anyone who might recognize the girl or the bag and the clothing. "We don't have any information on this victim," Hoglund said. "We don't have any motive, why this happened, how this happened." A card is left near a Hacienda Heights equestrian trail where the body of a girl was found Tuesday March 5, 2019.